I can't believe I've never shared this recipe. It is so simple and delicious! You can have it for breakfast, a snack, or dessert. It keeps well and freezes wonderfully. You can use fresh or frozen fruit and the rest of the ingredients are pantry staples. A buckle is essentially a cake filled with fruit and (optionally) topped with a crumble topping. 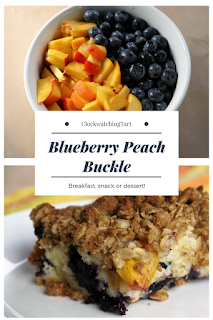 Buckles, along with similar evocatively-named desserts like grunts, slumps and cobblers, are a great way to use an abundance of fresh fruit before it goers bad. At this time of year we still have a lot of fresh berries and stone fruits in the local markets. This recipe uses peaches and blueberries, but you could use any berries you like, or even plums. For the buckle, whisk together the flour, baking powder and salt. In a separate bowl mix together the butter, sugar and egg until fluffy. Add the milk slowly and mix until combined. Stir in the dry ingredients until just mixed. The batter will be quite thick. Carefully fold in the peaches and blueberries. Spread the batter evenly in a greased 9-inch square baking pan. Mix the crumble topping ingredients together until combined and sprinkle over the buckle batter. Bake at 350 degrees for 50 minutes until a wooden skewer inserted in the centre comes out clean. Cool 20 minutes before serving.